Challenges especially in the minimal invasive restorative treatment of teeth require further developments of composite polymerization techniques. These include, among others, the securing of a complete polymerization with moderate thermal stress for the pulp. The aim of this study is to compare current light curing sources with a blue diode laser regarding curing depth and heat generation during the polymerization process. A diode laser (445 nm), a LED, and a halogen lamp were used for polymerizing composite resins. The curing depth was determined according to the norm ISO 4049. Laser output powers of 0.1, 0.5, 1, and 2 W were chosen. The laser beam diameter was adapted to the glass rod of the LED and the halogen lamp (8 mm). The irradiation time was fixed at 40 s. To ascertain ΔT values, the surface and ground area temperatures of the cavities were simultaneously determined during the curing via a thermography camera and a thermocouple. The curing depths for the LED (3.3 mm), halogen lamp (3.1 mm) and laser(0.5/1 W) (3/3.3 mm) showed no significant differences (p < 0.05). The values of ΔTsurface as well as ΔTground also showed no significant differences among LED, halogen lamp, and laser(1 W). The ΔTsurface values were 4.1LED, 4.3halogen lamp, and 4.5 °C for the laser while the ΔTground values were 2.7LED, 2.6halogen lamp, and 2.9 °C for the laser. The results indicate that the blue diode laser (445 nm) is a feasible alternative for photopolymerization of complex composite resin restorations in dentistry by the use of selected laser parameters. 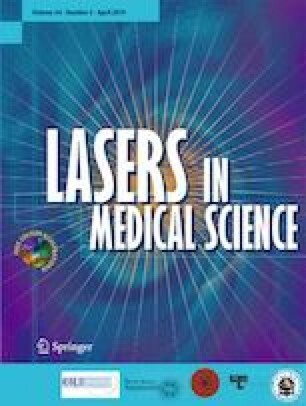 The authors would like to thank Dentsply Sirona Germany for providing the blue diode laser system. This study was funded under the research budget of AMLaReBO (Center of Applied Medical Laser Research and Biomedical Optics) at Bonn University.